Kim Van Der Sloot of Sibley Specialty Care received Care Initiatives Outstanding Business Office Manager Award for 2015. Van Der Sloot joined the staff as a nurse aide in 2003, with the goal of getting an associate’s degree. When she accomplished that, she applied for the business office manager position and has been in that position since 2008. 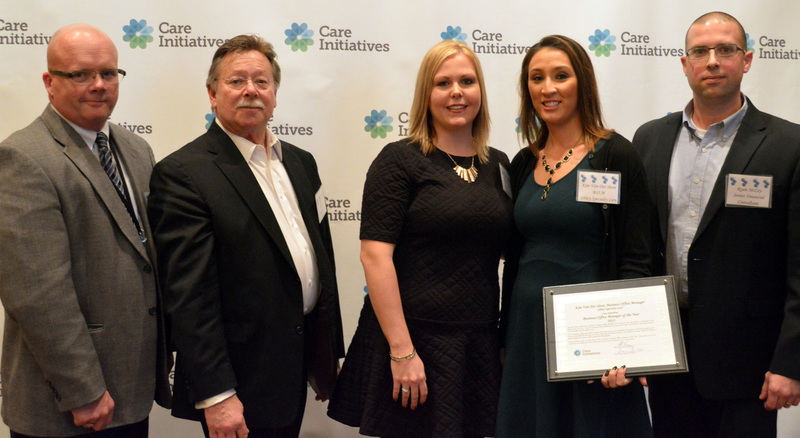 “She takes great pride in our accounts receivables, consistently one of the lowest in Care Initiatives. Kim works hard to keep our financial house in order,” says Administrator Jessica McDyer. “We really appreciate her team approach,” McDyer adds. Sibley Specialty Care is a 51-bed skilled nursing facility offering rehabilitation services, skilled nursing care, long term care, and hospice care. It is owned and operated by Care Initiatives, Iowa’s largest not-for-profit senior care provider. With headquarters in West Des Moines, Care Initiatives and Care Initiatives Hospice operate 56 skilled nursing care, rehabilitation, Alzheimer’s/dementia, assisted living and hospice locations throughout Iowa. For more information about Care Initiatives, visit careinitiatives.org or call 712-754-3629.